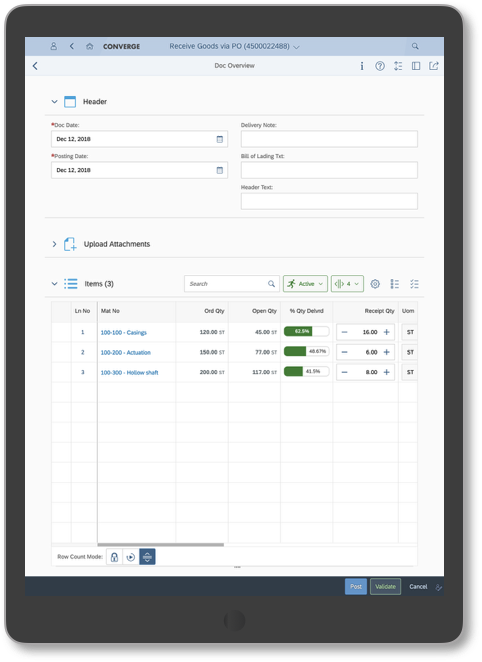 Maximize productivity, reduce inventory costs, and avoid inventory reconciliation errors with Converge’s Inventory Management apps that offer a simple-to-use, real-time solution for goods movement. The goods movement apps empower warehouse staff and project teams with the ability to monitor and execute inbound and outbound deliveries in an automated and efficient way while reducing inventory costs and any interruptions to supply chain operations. Reduce foot traffic with quick and easy access to information from anywhere. With the Goods Receipt app, you can instantly post the receipt of goods with reference to a purchase order, stock transport order, inbound delivery, or outbound delivery from anywhere. Proposes a selection of reference documents that can be used based on item status, authorization, and personalization settings. Distribute purchasing cost to multiple account assignments. Attach documents or images to the material document. Smart lookups ensure material is coded to right stock type and account assignment. Quick access to reference document details — including notes, attachments, and account assignments. Real-time visibility into stock levels and material document history. Goods Issue app empowers warehouse staff to issue material with reference to a reservation or manually by selecting a stock from the inventory. Proposes a selection of material stock based on authorization and personalization settings. Quick access to reference document details - including notes, attachments, and account assignments. Use up-to-date material stock to make time-sensitive decisions for uninterrupted execution of business. 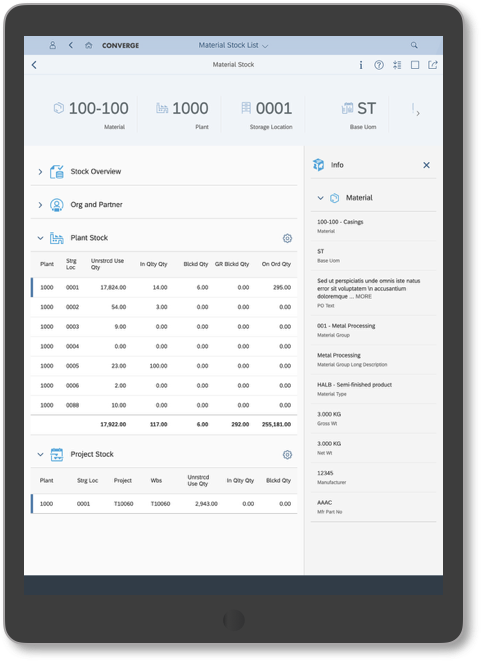 Stock Overview app offers real-time monitoring of material stocks by plant and storage locations for which you are responsible. Display material stock list with drill-down functionality to review stock at plant, storage location, and special stock levels. Display stock values and material details. Search stock by material, plant, storage location, special stock, accounting assignment, including by project, network, wbs, cost center, order, and more. Personalize stock list based on your area of responsibility — for example, project, plant, storage location, or material. With Material Documents app, you can monitor the material documents created as a result of goods movement activities. Display material document list with drill-down functionality to view header and item level details including, document and posting dates, movement types, material details, stock overview, purchase order history, and attachments. Reverse or partially reverse a selected material document. Search material documents list by document year, document number, document type, posting or document date, movement type, user, vendor, special stock, accounting assignment, including by project, network, wbs, cost center, order and more. Personalize the material document list based on your area of responsibility — for example, movement type, project, plant, storage location, or material. Instantly update stock levels and avoid any inventory reconciliation challenges down the road. 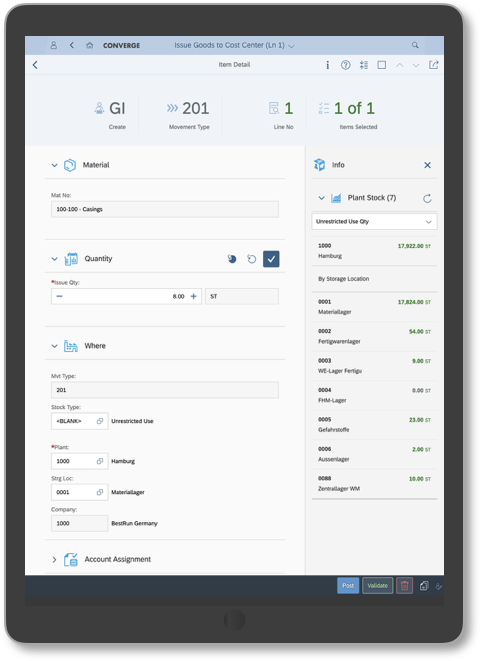 Based on SAP Fiori Design Principles, the apps offer personalized and optimized user experience enabling you to conveniently manage your work from anywhere — through a desktop or out in the in the field using a phone or tablet. Personalize the app to speed up the work by setting favorites, default input values & data filters, and preferred screen settings. Capture images of material or tickets and post the images as attachments, as part of the transaction. Advanced search feature lets you quickly find the information that you are looking for. Essential info is always just a few pixels away — no need to run multiple transactions or open additional windows. Guided procedures enables you to perform the operation in just a few simple steps — eliminating the paperwork and process delays. Share a link to a screen or document with other users or create variants of a tile for quick access to a screen or document. Behind the apps is our powerful configuration engine that seamlessly connects to the backend SAP Business Suite and enables admins to configure quick access tiles, screens, data provisioning rules, and more. Screens configuration enable you to setup easy access tiles, control behavior and access of screen objects, define global settings, and limits. Information provisioning is controlled via the highly flexible business rules engine. The app and transaction access is controlled centrally, through the backend SAP based authorization. Device agnostic - run it on mobile, tablet, or desktop. App automatically adapts to the device form factor. 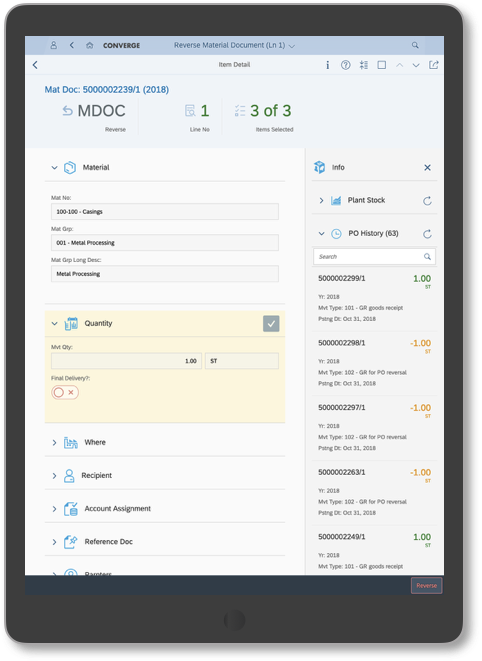 Understand how inventory management apps can help you save money, maximize productivity, and avoid inventory reconciliation errors today.